It’s been almost three years since the accident. Almost three years since that October evening when a drunk and high driver attempted to pass another car on Highway 121 and collided head on with Gustavo Mejia and his five-year-old daughter, Jazzlin. Jazzy, as we call her, was in kindergarten at the time, with my son at Cherry Valley School here in Petaluma. The velocity of the collision spun their car around, shattering Gustavo’s legs and snapping Jazzy’s small spine. The hours and days that followed that moment are almost too painful for their family to revisit. Cell phones rang, knees buckled, prayers and gasps of disbelief floated up from around Sonoma County. Popcorn moments of connectivity. As if our feeble attempt to claim her as our own would undo what had happened. Throughout the day the texts came in, updates on her status; she would most likely live, but it was unlikely that she would ever walk again. The subtext, the embarrassingly selfish place our minds wandered, was this; What if it had been my daughter? What if my child was lying in a hospital bed in Oakland, tubes breathing on her behalf? This is how we empathize, by imagining it happening to us. This instinct, or reaction, I believe is meant to be productive. To compel action. And it did. In the months that followed, there was a beautiful outpouring of love and support for the Mejia family. Quilts and care packages poured in, a website and trust fund were created, fundraisers planned. The generosity of the community, combined with their insurance, covered most of the large hospital bills, and even provided them with a car that would accommodate a wheelchair and specialized car seat. Jazzy spent four months in the hospital and rehab before returning home. Meanwhile, the driver of the vehicle that caused this tragedy awaited his trial. He had been driving with a suspended license, was drunk and high on cocaine and had a semi-automatic rifle with 53 rounds of ammunition in the car. He should not have been on the road that night. He pled guilty to all 16 charges filed against him and was sentenced to 25 years in prison. The communal response to this update? “Good. I wish it was longer.” But there is still an agitation that justice can’t quite soothe. Because when a reckless adult paralyzes a child, no punishment will ever fit the crime. Jazzy’s family met with lawyers and explored their options. Ultimately, there was to be no windfall settlement. Blood from a turnip, etc. The driver had nothing to speak of, not even insurance. The final settlement? $7000 each for Jazzy and her dad. This should make you angry. But like our empathy from the moment we heard about the accident, this anger should compel action. The drama of the accident is in the past, the press has slowed, we are used to seeing her in a chair now. Which is not a bad thing; I think the looks of pity early on were almost harder for her mother to bear. But here is the reality of the situation: the account created to help with her disability is very near depleted. 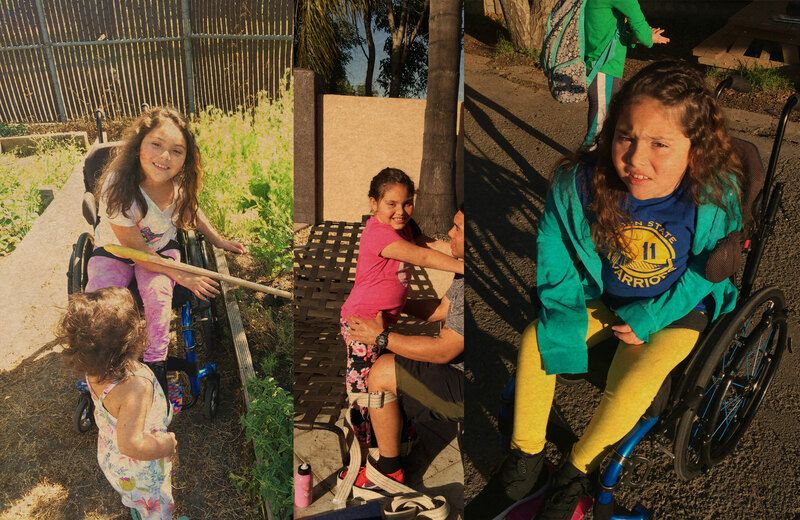 Jazzy takes part in a therapy called Project Walk that is not covered by insurance. In the past few months she’s had to cut back to going every other week, as it is just too expensive. She and her family live in a small apartment that is not ideal for her disability, but we all know how crazy rents have become, so they recently signed a lease for another year. The initial empathy we felt was meant to be a seed. Something we would tend to for the long haul. This didn’t just hit close to home because our kids were in the same class, or on the same field trip. This hit close to home because this hit us at home. Allow me to answer that question we asked ourselves when we first heard about the accident. It was your kid. That thought pops into your brain because the only way to move forward on this planet together is by taking care of each other. This happened to one of our kids. The system has failed to financially compensate her for the tragic loss of the use of her legs. We as a community can shake our heads and fists in anger, or we can join our minds together to find another solution. We all bring different skills and connections to the table; let’s use them. Let’s take care of our own. Let’s get Jazzy and her family into a house, a one-story rambler with wide hallways and lots of light. Let’s get her to Project Walk every week. Let’s come along side her parents, reminding them that they are not alone on this journey. Jazzy refers to the anniversary of the accident as her “Life Day.” The day she didn’t die. This October, on her Life Day, we are going to be putting together an evening of dreaming big for Jazzy’s future. Leaving the drama of the tragedy in the past, linking arms and pushing forward. A celebration of hope and community, full of stories and music and delicious food, all to benefit Jazzy. Ideally, this will even become an annual fundraising event. A seed, tended to by a community that loves its children. And you know what might happen while we are watching her grow into a strong, beautiful woman? We might get to know each other better in the process. Donations to help cover her medical and related expenses can be made out to the Jazzlin Mejia Trust Fund and can be deposited at any Exchange Bank location throughout the North Bay. You can also donate online via the Go Fund Me link.